I have had the distinct joy of visiting the Ella Valley Winery a few times in the past few years and each time I enjoy a bottle of Ella Valley wine I remember the first time I tasted a bottle of the stuff – at a restaurant! 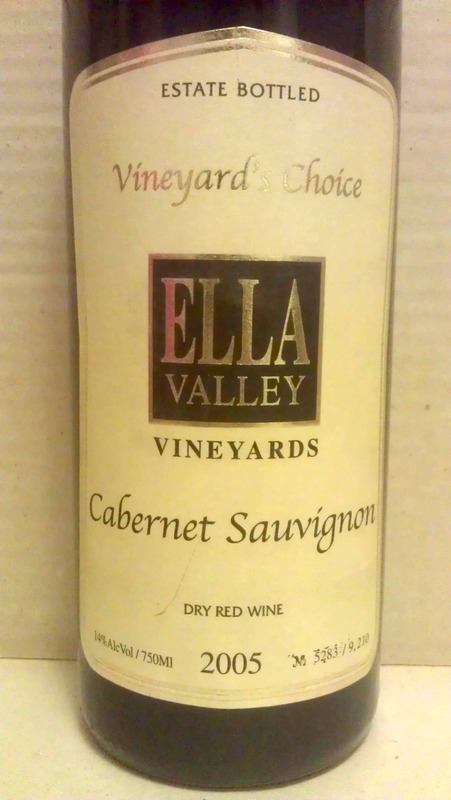 Yes indeed, the first time I heard of Ella Valley Winery was at a restaurant where they were serving the 2002 Ella Valley Cabernet Sauvignon, Vineyard’s Choice! The wine was being sold at the restaurant – the new defunct Rafael’s that existed in Berkeley, CA for many years, until its unfortunate closing in July 2007. Whenever I went there with friends I always ordered the same wine, as it was rich, layered and awesome! 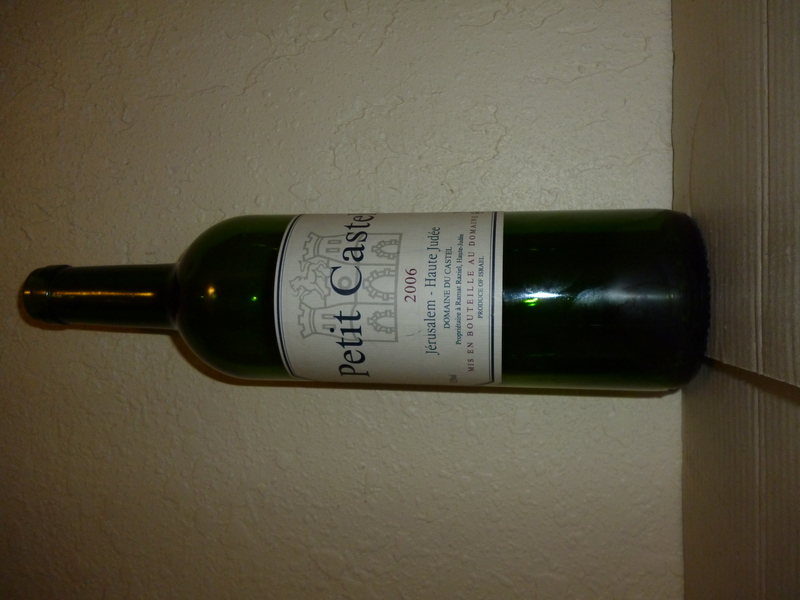 I finally convinced some wine stores to stock it as well and it was then available to others and me in 2005. With Shavout coming up and the desire to take it a bit easy, I made some lovely vegan meat sauce along with quinoa and pasta. The vegan meat sauce is so easy to make and so absolutely tasty that I thought it best to put the recipe here. Heat the oil till almost smoking and throw in the diced onions until they are nicely caramelized. After that throw in the zucchini and saute them till they soften. Then throw in the mushrooms and cook them till they start to soften, but do not let them get too soft or browned as you want them to still have a bite. Finally throw in the spices and then the last four ingredients and cook for another 30 or more minutes until the sauce thickens, stirring often and making sure nothing sticks. 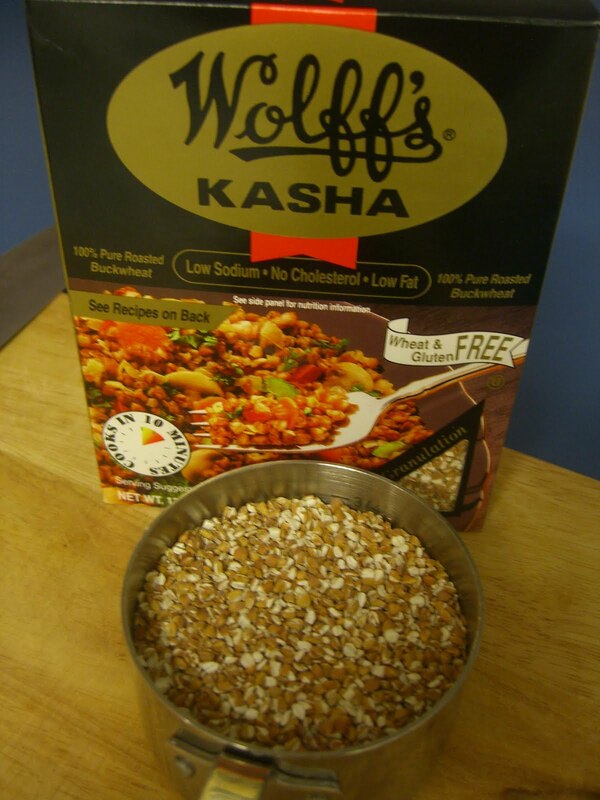 I enjoyed this over a bed of quinoa and my wife had pasta, but this goes well over any starch you may desire. 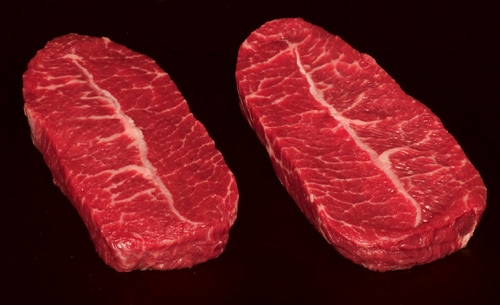 It has good bite and flavor, while also being low in calories and fat. 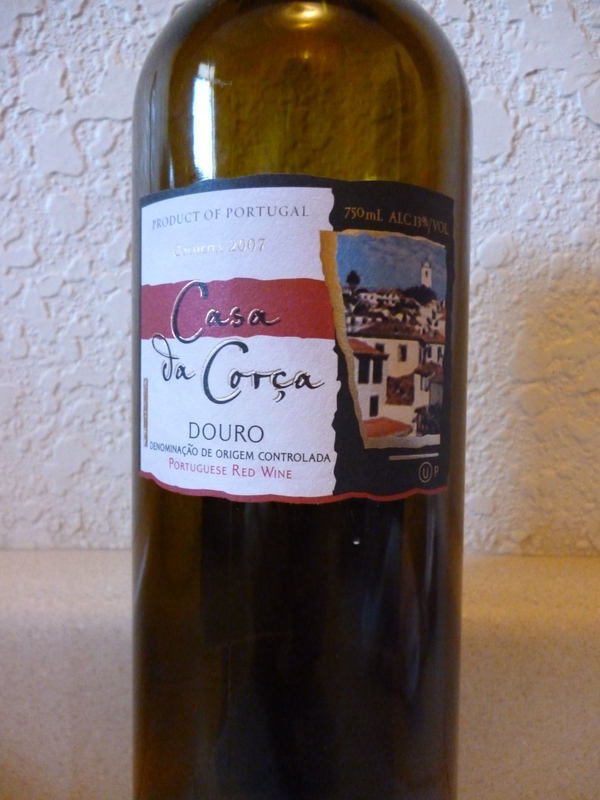 To pair with this dish I opened a bottle of the 2007 Casa da Corca. I guess the saying, you get what you pay for really lived up to its billing. This wine was on sale during the Passover sales and this one was not worth it. The wine is fine, but not one that I wanted to waste my Shabbos wine on. Either way, drink UP if you have some and do not let it stay too long in the bottle. Either enjoy it right after you open it or save the rest to pour into a great pot of vegan meat sauce! The nose starts off with an conspicuous amount of toasty oak followed by blackberry, black cherry, a hint of raspberry, tobacco, and lovely smokey notes. 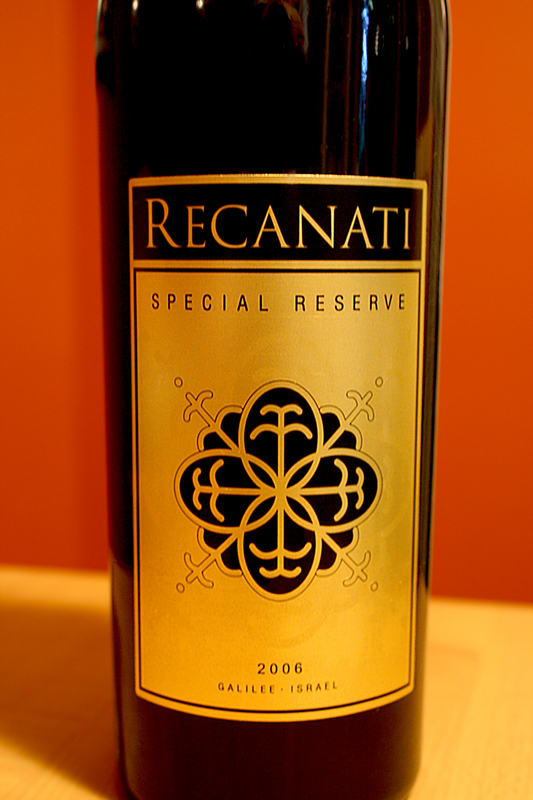 The mouth is medium to full bodied with almost mouth coating integrating tannin, a large dose of blackcurrant, that is balanced with good oak extraction, earthy notes, and herbs for a pleasant mouth feel. The finish is long with citrus zest, at times, lovely espresso coffee, vanilla, licorice, and cloves. This is in drink up mode. The wine is not showing mevushal characteristics, but is quick to fade, losing its brightness and flavor profile within hours of opening. DRINK UP! This past weekend, I was on a mission from God (in my mind anyway) to make the best possible meatball possible. 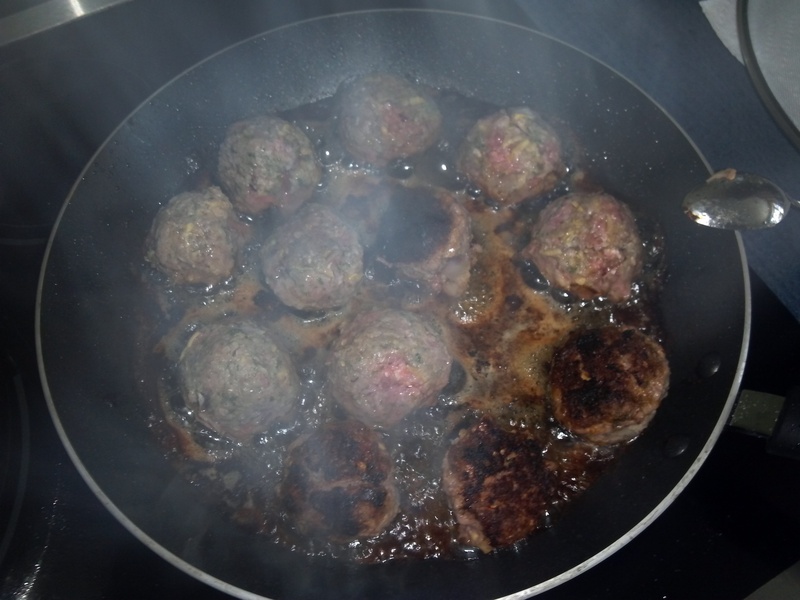 My wife thinks I have gone crazy, because to her the meatballs we have made in the past were fine to her, and they are. Still, my quest to make the perfect meatball cannot be quenched, though this past iteration was quite possibly my best. There are some more tweaks we will need to do, but more on that soon. Now I wanted to make a single meatball recipe, but two different sauces. Why? Simple, my wife was not interested in a meat based sauce, and I did. Now the only con to frying meatballs is that the sauce you make has no meat flavor in it. Yes, the onions and base can start from the fat that is rendered from the fried meatballs, but that still does not cut it. A true meat sauce requires meat flavors to be fully integrated in the sauce, via cooking and reducing with the meat, thereby concentrating the meat and tomato flavors, in combination. 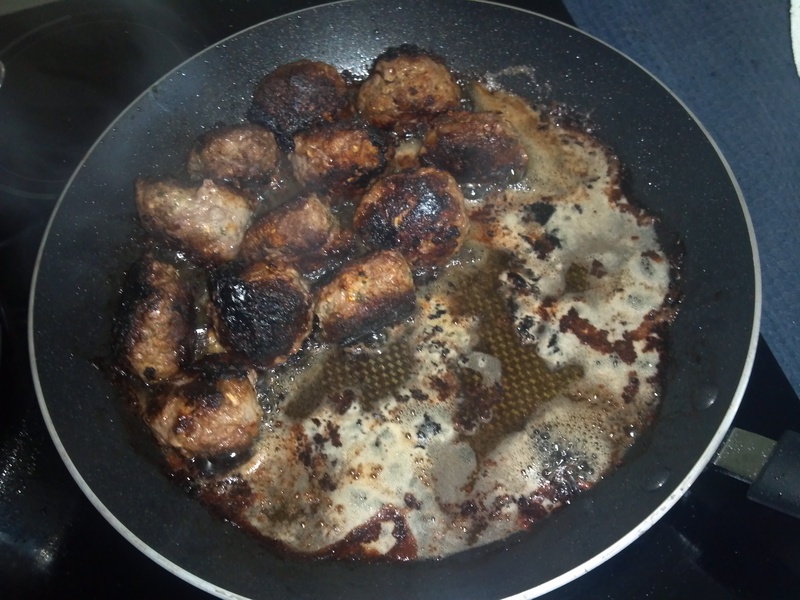 Further, I was NOT going to braise the meatballs after I went to the trouble of frying them and getting them nice and crunchy to only lose that in a pot of sauce! So, I was left with the trouble of cooking two sauces, one with the rendered fat and one without. To get the rich meat flavor, I further rendered the fat of Nechama’s Smoked Andouille sausages (made from turkey and chicken), and then cooked them in the completed tomato sauce, to enrich the sauce with a lovely bit of heat and meat flavor. While this was successful, the extra sausages did not render well enough for me, and the extra steps were not worth the final outcome. My wife does not often make it but when she does I always appreciate it. I am talking about her roasted almond coated chicken! 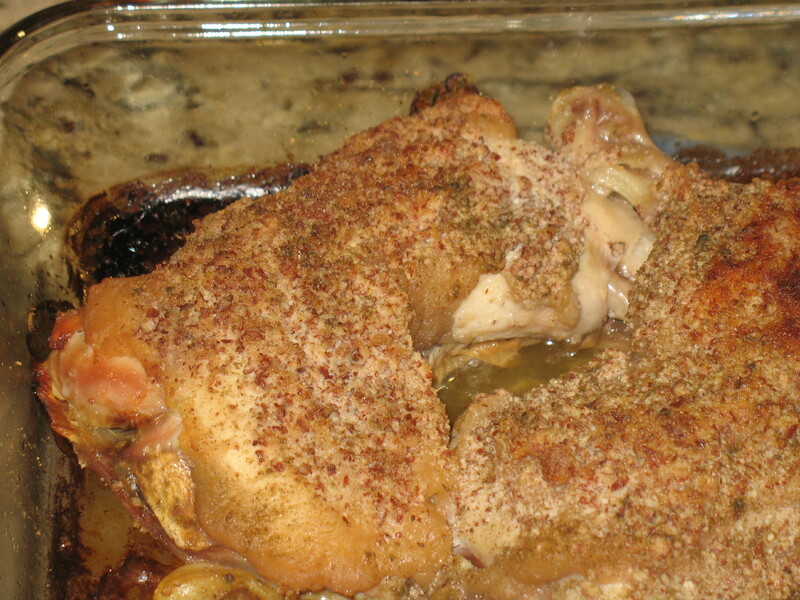 The recipe is really quite simple and it is her personal recipe and it tastes awesome! To pair with this wonderful dish I opened a lovely bottle of the 2003 Four Gates Merlot. 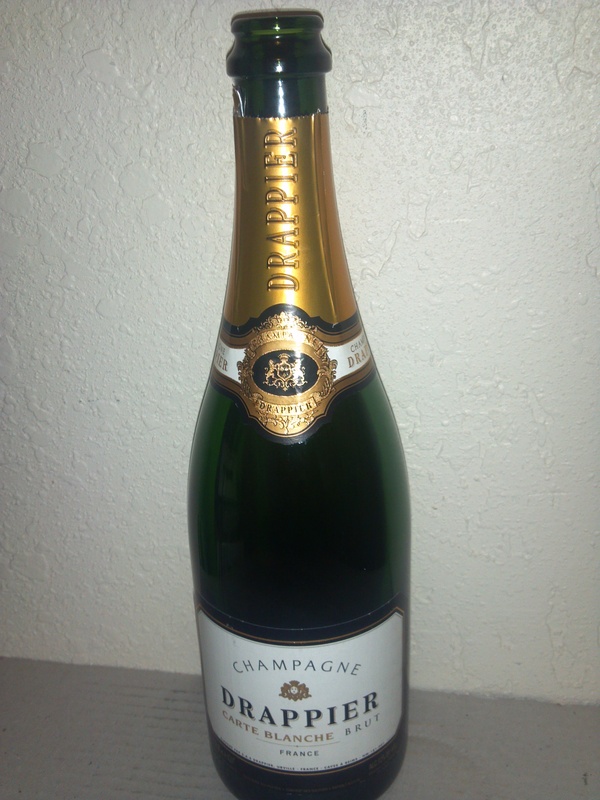 The funny thing about this bottle was that it was slightly out of whack a few years ago. A few years ago the acidity was way too high and it would dominate the palate. Now, the acid has calmed down, the wine’s muscle and full body is now in full bloom, and the chocolate and fruit are showing quite well, along with some rich oak. The wine is really a joy and a crazy good deal at 20 bucks! That is the good news the bad news is that I think it is sold out 😦 We paired the chicken with a lovely kasha and mushroom pilaf and a fresh green salad.